Retail group says Father's Day shopping will reach $9.8 billion. Dads should have plenty of shirts and neckties in their closets by the end of June, if predictions by the National Retail Federation are on the money. According to the organization, clothing will be one of the top gifts for Father's Day this year. In fact, 36.7 percent of shoppers are expected to buy Dad some type of garment, and total spending on clothing will reach $1.3 billion. Electronics will also be popular gifts among shoppers, who are expected to shell out $1.2 billion on gadgets. Consumers could also spend an estimated $749 million on greeting cards, $578 million on tools or appliances, and $550 million on home-improvement and gardening tools, NRF reports. 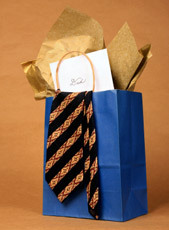 However, 30 percent of shoppers will let Dad choose his own gift and will opt to give him a gift card. "Whether it's a large family get-together, or surprising Dad with a new gadget he's had his eye on, there are many ways people will choose to celebrate this year," says Matt Shay, president and CEO of the NRF. Total Father's Day spending is expected to reach $9.8 billion with buyers spending an average of $94.32, a slight increase compared to last year's $90.89. Online sellers should reap the benefits, as 20 percent of shoppers are expected to go online for their Father's Day shopping.